Few years ago, I visited Youhanabad, one of the largest Christian neighborhood in Punjab, Pakistan. I remember the long terrain of endless houses that had an acute sense of love and unity in the air. Today this sense of a peaceful community has gone and instead blood, violence and destruction show their grim presence after 15 innocent people, including 7 Muslims, died last week in the wake of suicide Church bomb attacks on March 15, 2015. The unfortunate history of minorities in Pakistan is littered with violence and institutional discrimination at all levels. Minorities receive a "step mother love" from the land they belong to. Their patriotism is questioned and their loyalty to the country is often mingled with doubt and suspicion. Are Christians alienated in their own country? In Pakistan, the history of minorities in general and Christians in particular is reddened with blood of innocents with endless catalogues of persecution. The memories of the unspeakable horrors of 1997 in Shanti Nagar are still fresh. The attack by thousands of violent fundamentalists destroyed 785 homes and 4 churches and subsequently 2,500 people fled persecution. A similar event took place in 2009 when the Christian villages of Gojra and Korian were hit by religiously motivated violence. Nine Christians were burnt to death when their homes were attacked with chemical fire bombs locals had made themselves. The worst attack to date, took place in March 2013 in Peshawar when the All Saints Church was hit by a twin suicide bomb attack which left more than 100 dead and no less than 250 injured. In November 2014 the Christian couple Shehzad Masih and Shama Bibi were beaten to death by a Muslim mob after being accused of desecrating a copy of Koran. In the midst of this ever-increasing persecution the terror-stricken Christians have no hope but to clamour for help to the Government which seem to have no ears at all. Christians find no protection of the law as their vulnerability is even exploited by the laws itself since they give room for the wide misuse of Pakistan blasphemy laws, which further compounds their precariousness, disillusionment and alienation. In most liberal democracies around the world, the law of the land should be the life blood for its citizens. It protects and promotes basic and fundamental rights of its citizens regardless of race, religion, language or any other background. However, in Pakistan, laws are more often than not used to spite the weak and the vulnerable and they often support the strong. Laws should be equally applied to everyone, but how far government has provided protection and justice to the victims of persecution? How many of those who killed Shehzad Masih and Shama Bibi have been charged with murder or terrorism? Who among the attackers of Shanti Nagar or of Gojra and Korian has ever been prosecuted? To fully understand the two-faced nature of Pakistan's approach to justice system a recent statement of Pakistan Interior Minister, Chaudhry Nisar is worth to mention here. Commenting on the post Lahore Church blasts violence which saw two Muslim men burnt to death by violent Christians Nisar said: "Lynching is the worst form of terrorism." Without doubt it is true that no one has a right to take law in its own hand and those who perpetrated this heinous crime of lynching two men should be brought to justice. Nevertheless, it is equally important to treat all citizens with justice. True rule of law does not allow any sense of alienation or stigmatisation. What further punctuates the sense of alienation among Christian community is the cold reaction of political elite in Pakistan who tend to disengage themselves from the horrors Christians frequently suffer. It stokes the sense of alienation which leaves millions of Christians discouraged, dispirited and disillusioned. When terror attacks happen around the world, the government officials rush to the scenes of violence including the premiers. The iconic presence of a premier in the midst of terror stricken people provides them the moral courage they need it the most. When France faced the horrors of the attacks on Charlie Hebdo and on a Jewish Supermarket in Paris in January this year, President Francois Hollande not only showed presence at the scenes of violence he further invited other heads of government to march with him and the French people in unity against terrorism. Pakistan's Prime Minister Nawaz Sharif on contrast was more interested in celebrating a multi-million motorway project rather than to give condolences to the victims in person. To cap it all, no government minister attended the bereaved families of Youhanabad at the time of writing these lines let alone the Prime Minister, Nawaz Sharif. 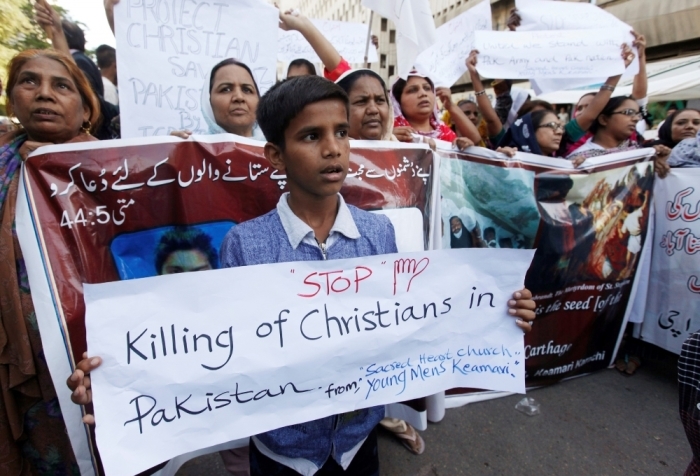 Pakistani Christians have long suffered the scars of persecution in the guise of misuse of Pakistan blasphemy laws to the terrorist bomb blasts in their places of worship, never before in the history Pakistani Christians took law in their hands, let alone killed innocent people on the whims. We have to ask ourselves and the government of Pakistan how it could come this far. Why are Christians so much alienated so that they resort to such violent acts of lynching to vent their helplessness? Has their cup of patience overflowed or the pangs of persecution have become so unbearable that the violent acts of lynching seem to be the only chance to draw attention? It is the first and foremost responsibility of the echelons of any state to provide legislation which serves the weak and the strong alike. They have to ensure that laws are applied equally to all citizens and that the justice system neither favors nor discriminates anyone on grounds of their race, religion, language or any other background. Only then alienation will stop and persecution be eliminated so that Pakistan as nation can find its peace and prosperity in unity to combat the challenges of the 21st century.